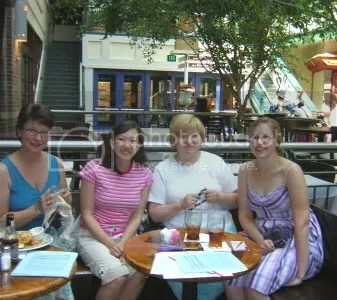 Today was World Wide Knit in Public Day and my knitting group turned out in a downtown mall. We wanted a place with air conditioning because Memphis is about 2 million degrees in the summer and today was an orange alert ozone day to boot. This is a smallish mall aimed mostly at tourists but it has a sunroof that lets in a lot of light so it seems like you are outside only without the heat stroke. Plus we sat outside the Dan McGuiness pub so there was food and drink readily available. We were knitting hats and I started a watermelon hat for the Queen Bee aka Bronwyn. Gwen finally starts school on Monday and I am so ready to get back into a routine! I have worn myself out trying to keep her busy. 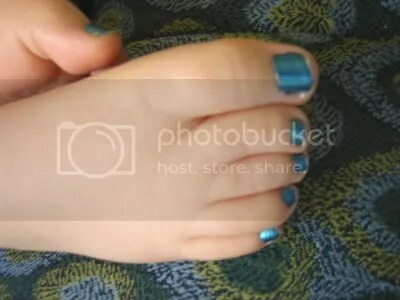 Elisabeth gave her a chrome blue pedicure. On Tuesday she went to see Over the Hedge with Alexander but there are no pics because I forgot to put the card back in the camera. They plan to see Cars next. On Thursday she went swimming with Baby J, the daughter of one of Elisbeth’s friends. Baby J is 7 months old so she and Gwen are on about the same developmental level. They both had fun and talked to each other a lot. This entry was posted on June 10, 2006 at 8:04 pm and is filed under Uncategorized. You can follow any responses to this entry through the RSS 2.0 feed. You can leave a response, or trackback from your own site.